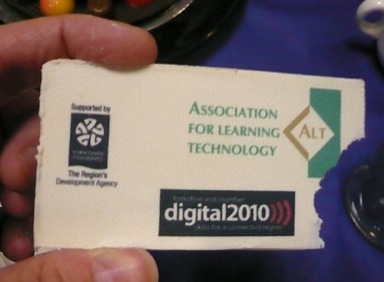 So this is my round up of some of the highlights of my ALT-C2008, and links to some of the stuff we made & documented. Thanks to ALT for an excellent conference, and to everyone who I was lucky enough to get to hang out with this year. As Steve Wheeler's already noted, it was a excellent one. The 4th ALT-C Edublogger meetup went down a storm, we had a great time and managed to take over a substantial section of the pub. I've posted the list of attendees and blog links over at the F-ALT site - again, please do edit your entry/add yourself in if you were there. I co-hosted a live radio show with Graham Attwell at the conference for Emerge - one of the series of Emerging Sounds of the Bazaar shows. It was probably the most fun it's possible to have at a conference (for me anyway, Scott Wilson didn't seem to enjoy his surprise interview quite so much). Cristina Costa did a fantastic job facilitating the live chat room for our international audience and Joe Rosa an equally amazing job with the production. If you missed it, you can recapture the craziness over at Graham's blog. I also helped run an official conference workshop session, Learning About the Digital Divide, along with Frances Bell, Helen Keegan and Cristina Costa. Our session built the experience of our first slam workshop the year before, which encouraged participants to create and perform what we are calling slams (after the style of Poetry Slams http://en.wikipedia.org/wiki/Poetry_slam), that time around their experience of engaging with web 2.0. Our slam are really shorthand for a rapid, creative approach to creating a performance and/or object which engages with, and encourages others to engage with, an aspect or description of a topic. In this way we're seeking to do a few things. The approach is designed to support innovative, conversational and light weight content creation, acting as a counterpoint and compliment to traditional academic processes and methods. You can go view the amazing contributions people created and delivered during the session over at the wiki, and also (until tomorrow night) vote on which is your favorite. My slam - I <3 Public Libraries is included in the vote list, but please don't vote for it! It's only there because I was really rubbish at getting it up in time and into it's proper place in the sample slam lists. The text I've included with the slides includes my workshop methodology, so do go and browse if you are interested in exploring this kind of format yourself. Finally, I'm still really happy about winning the Learning Technologist of the Year award. I brought a hard copy of the announcement back for my mum, and she's very pleased too :) If you'd like a flavor of the gala dinner and a peek at the presentation check out James Clay's excellent (& very) short film of the evening. I eat chocolate in it. Looking forward to next year already. You can see my pictures here and Sam (who always takes the best ones! )'s pictures here. It was a very good year which might have been due to the breath of sessions ranging from keynotes to F-ALT. For me it was refreshing to frequently switch between the formal and the informal. This culture shifting kept my brain and enthusiasm alive in what can feel like a very long conference. Thanks to formal and informal organisers alike.